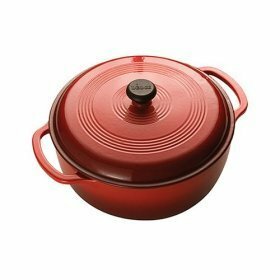 Cast from molten iron, the Lodge Dutch Oven holds in heat and evenly distributes it on all sides, including the lid. The lid fits tightly to keep moisture in the oven and in your food. Braise, simmer, bake, saute, or prepare marinades inside. The five inch deep interior offers plenty of room for deep dish foods or large quantities. Food won't react with the enamel interior, so you can store leftovers right in the pot and there's no need to season the pan as you have to with raw cast iron. The chip-resistant glossy porcelain enamel is double coated to be a very hard surface which is easy to clean. Lodge suggests you retain the rubber shipping bumpers for storage of the lid to help prevent chips. This oven can be used on a variety of stovetops, in the oven, and stored in the refrigerator or freezer. It's dishwasher safe, but hand washing is recommended to better preserve the enamel coating. Comes with a lifetime warranty.You'll want to read the directions for proper use of the cookware with your particular stove as it is a heavy item which can scratch if slid rather than lifted and ceramic cooktop use involves special instructions. The knob on the lid is only oven safe to 400 degrees and this pan is not for outdoor grills or outdoor open flame. Does come right to the table with its beauty, but beware of the heat retention and avoid melting a countertop or marring a dinner table. Lodge is an American cookware company, but the item is made in China, which may be a turnoff for some customers. Customers seem to be universally pleased with the Lodge product and it has received rave reviews from Good Housekeeping and Fine Cooking. Items which can't be prepared in cast iron due to acid or difficult clean up, can be readily made in this version of dutch oven. Also, as seasonings don't remain in the pan, if you make heartily spiced meals, the flavors won't meld together with those of previous preparations. A workhorse of a pot.